There were, at one point, 305 Ponderosas (and sister buffet Bonanzas) in the US, and today there are 75 locations total — including 19 in Puerto Rico and a handful scattered in Egypt, Qatar, Taiwan, and the UAE. The Ponderosa parent company filed for Chapter 11 bankruptcy in 2008, the same year as the company that owns Old Country Buffet (and four other buffet chains). That company, Ovation Brands. filed for bankruptcy twice more by 2016, at which point USA Today noted that it had “the dubious and relatively rare distinction” of entering what finance guys like to “jokingly refer to as Chapter 33 — that is, Chapter 11 bankruptcy for a third time.” The same year, Garden Fresh Restaurants, which owns Souplantation and Sweet Tomatoes, filed for bankruptcy as well, citing $175 million in debt. As we walk the line, we might spare a thought for Benjamin Eisenstadt; he died on this date in 1996. After a stint running a cafeteria in the Brooklyn Navy Yard, Eisenstadt became a manufacturer, first (and briefly) of tea bags, then of an invention of his own– the single-serving sugar packet. In 1957, he began mixing powdered saccharine (previously available only in a liquid form with dextrose, and created Sweet’N Low, a no-calorie sweetener available in (his) single-serve packets, which he colored bright pink to avoid confusion with (white) sugar packets. Eisenstadt was also the first to packet soy sauce in single-serving packets. Just one of the hundreds of recipes one can find at Growlies, “the place to find large quantity recipes. This one is from the “advanced” section: Really BIG Recipes— meals for 100+. As we ruminate on repasts, we might spare a thought for Nathan Handwerker; he died on this date in 1972. 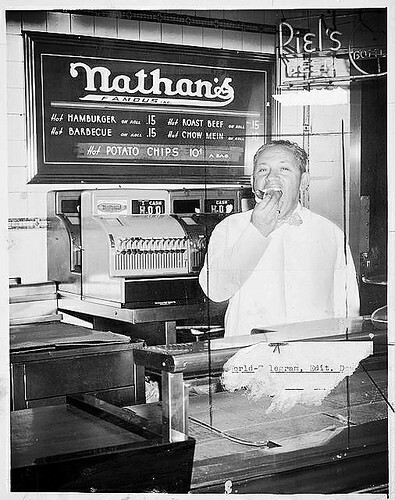 In 1916, with $300 borrowed from friends, he and his wife Ida started a hot dog stand on Coney Island– and launched what evolved into Nathan’s Famous restaurants and the related Nathan’s retail product line. An emigrant from Eastern Europe, Handwerker found a job slicing bread rolls for Feltman’s German Gardens, a Coney Island restaurant that sold franks (hot dogs) for 10 cents each. Encouraged by a singing waiter there and his piano player– Eddie Cantor and Jimmy Durante– Handwerker struck out on his own, selling his hot dogs (spiced with Ida’s secret recipe) for a nickel. At the outset of his new venture, he reputedly hired young men to wear white coats with stethoscopes around their necks to stand near his carts and eat his hot dogs, giving the impression of purity and cleanliness. Your correspondent is heading off on a trek to the remoter reaches of the American Southwest, where connectivity will if iffy at best. Regular service will resume on or around April Fools Day… appropriately enough. From “Maple Bacon Latte” through “Tumeric and Matcha in Coffee” to “The Peanut Butter Solution: PB2 in Coffee.” he guides one through preparation, then assesses the results of dozens of adventurous brews. As we broaden our horizons, we might recall that today is National Margarita Day. While its origin is uncertain (there are several competing creation stories), it is indisputably the most-ordered cocktail in the U.S., accounting for almost 20% of all mixed drink sales in the U.S. Contrast with the U.S. healthy eating guidelines, and its “food pyramid.” For an account of the lobbying that went into those U.S. recommendations, see here and here. As we parse prudence, we might spare a thought for James L. Kraft; he died on this date in 1953 (though some sources give the date as September 16). A wholesale cheese distributor and producer, he patented pasteurized process cheese in 1916. A low-cost cheese product that would not spoil, it wasn’t an immediate hit with the public, but the U.S. army purchased over 6 million tins of it during World War I. During the depression, it became more broadly popular because of its low cost. The typical American “breakfast, lunch, and dinner” pattern is a product of the Industrial Revolution. Early U.S. dining habits were shaped by those of English colonists. And, as Anne Murcott, a British sociologist specializing in food, writes, for centuries, up until about 1800, most English people ate two, not three, meals a day. The larger of these was often called dinner, but it wasn’t typically an evening meal. During the reign of Henry VII, from 1485 to 1509, the day’s big meal normally took place around 11 am. In both England and the U.S., dinner became the large afternoon meal for farm families—which is to say most families—in the eighteenth and early nineteenth centuries. It might be preceded by breakfast—the meal to break the nighttime fast—and followed by some kind of light meal or meals, variously called supper or tea. As we dig in, we might recall that it was on this date in 1999 that the Russian Duma (its legislature) voted 273-1 to pass an animal rights bill that prohibited Russians from eating their “animal companions”– their pets. Shortly thereafter the newly-elected President of Russia, Vladimir Putin, vetoed the bill. As we devour with devotion, we might recall that it was on this date in 1993 that the first “Got Milk?” ad premiered. Created by the advertising agency Goodby Silverstein & Partners for the California Milk Processor Board, it was later licensed for use by milk processors and dairy farmers nationwide. The campaign launched with the now-famous “Aaron Burr” television commercial, directed by Michael Bay. It is hard to think of a food more emblematic of America’s working-class spirit than the humble tuna sandwich. While the Spanish make their tuna bocadillo with piquillo peppers and sherry vinegar and the French have their pressed pan bagnat, made with high-quality jarred tuna and an array of vegetables in a real baguette, the American version is an object of convenience and thrift. As we muse on a melt, we might spare a thought for Clarence Birdseye; he died on this date in 1956. An inventor, entrepreneur, and naturalist, and the founder of the modern frozen food industry. On Arctic trips as a field naturalist for the United States government, he noticed that freshly caught fish, when placed onto the Arctic ice and exposed to the icy wind and frigid temperatures, froze solid almost immediately. He learned, too, that the fish, when thawed and eaten, still had all its fresh characteristics. He concluded that quickly freezing certain items kept large crystals from forming, preventing damage to their cellular structure. In Sep 1922, Clarence organized his own company, Birdseye Seafoods, Inc., New York City, where he began processing chilled fish fillets. He moved on to vegetables and other meats, then to the “fish stick,” along the way co-founding General Foods. In the end, Birdseye had over 300 patents for creating and handling frozen food. Every cuisine, while sharing many common elements with others, uses a handful of ingredients that combine for unique flavors. With Chinese food, you often see soy sauce, green onion, and sesame oil. With Italian food, you often see garlic, parmesan cheese, and olive oil. Vietnamese food uses fish sauce. Korean food uses chili paste. As I venture into new cooking territories, it’s been fun to discover the flavor bombs from various cuisines. A lot of “where have you been all of my life” moments. As we read it and reap, we might recall that it was on this date in 1903 that Italo Marchiony applied for a patent for an ice cream cup mold. Marchiony is credited with inventing the ice cream cone in 1896, when he introduced it in New York City. Initially, he folded warm waffles into a cup shape. He then developed the 2-piece mold that would make 10 cups at a time. (U.S. patent No. 746,971 was granted on Dec 15, 1903). Several other claimants introduced “ice cream cones” at the 1904 Louisiana Purchase Exposition, known as the St. Louis World’s Fair. While they weren’t the inventors of the cone, it was from the time of the Fair that the edible “cornucopia,” a cone made from a rolled waffle, vaulted into popularity in the United States. Launched in 1931 by former amateur boxer Art Whizin, the Chili Bowl chain had 22 outposts at its peak. Each building was round and shaped like a chili bowl with 26 stools around a circular counter where diners could get the signature dish: an open-faced burger blanketed with chili. This 1937 photo shows the original Chili Bowl, located at 3012 Crenshaw Boulevard. As we muse on the mimetic, we might sparea thought for Charles Elmé Francatelli; he died on this date in 1876. A Italian chef working in England, renown in his time, he was chef to Queen Victoria and Prince Albert for a time, chef of the St. James Club, among other prestigious postings . But he is probably better remembered for his best-selling cookbooks, The Modern Cook (1845), A Plain Cookery Book for the Working Classes, The Cook’s Guide and Housekeeper’s & Butler’s Assistant, and The Royal English and Foreign Confectionery Book. A quick and fascinating history at “The Evolution Of The US Interstate Through Time, Mapped“; explore Geotab‘s interactive timeline here. As we hit the road, we might send healthy birthday greetings to Sylvester Graham; he was born on this date in 1794. A presbyterian minister, he is better remembered as a dietary reformer who preached vegetarianism, supported the temperance movement, and emphasized eating whole-grain bread. Though he neither invented nor profited from his legacy, his sermons inspired his followers to create graham flour, graham bread and the graham cracker.